It's more than just a cliché - one man's terrorist is another man's freedom fighter. Or patriot. Or nationalist. The Times of London recently reported on a rather curious document from the Middle East. The document contains a clear warning for British troops from terrorists of dire consequences. British soldiers are described in the document as forming part of an alien and hostile occupying force that is "illegal and immoral". "It is unavoidable that many... British soldiers should fall. And it is only fair that these people know at least why they may be killed," the document reads. "You have learned what the word 'terrorist' means, some of you may even have come into direct contact with them (and heartily desire not to repeat the experience). But what do you know about them? Why does a young man go underground?" Why indeed? 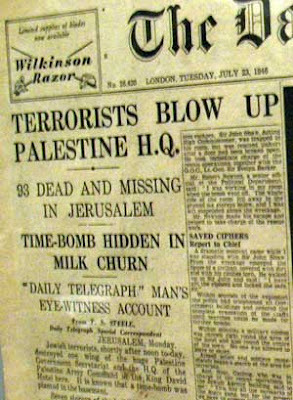 The document describes the ongoing British occupation as "parallel to the mass assassination of a whole people". Apparently, terrorists used similar language in another pamphlet which was pinned to the bodies of two booby-trapped British soldiers. Naturally, this kind of language would draw fire from allegedly conservative columnists, shock jocks, pundits and politicians. This is hardly the sort of language you'd expect to hear from someone committed to peace in the region. But why did I describe this document as curious? Isn't just the sort of language Middle Eastern terrorists use all the time? Of course it is. And it's precisely the language that was used by Irgun, a terrorist group led by a man named Menachem Begin, a terrorist who went on to sign a peace accord with Egypt and win the Nobel Peace Prize. This pamphlet represents the kind of priceless message that those fighting the so-called war on terrorism need to remember. We need to understand that today's enemies can become tomorrow's allies. We also need to understand that today's terrorists often repeat the strategies used by today's allies when they were terrorists. There's another lesson in this document. Britain lost the war against Jewish Zionists in Palestine because it refused to understand and appreciate why these young men and women were prepared to lay down their lives for a cause. Britain did not understand that behind the murder and mayhem of these terrorists was a cause based on universal moral imperatives with precedents in British history. Australia and its allies in United States, Britain and other countries will not win the war against today's Islamic Zionists - people prepared to establish allegedly Islamic states in Iraq and Afghanistan and elsewhere - unless we understand the moral logic that terrorists use. If we use the brutality of terrorists' methods as excuse to ignore genuine grievances that many of us once experienced in years gone by, we will lose both the battles in Iraq and Afghanistan and the wider war on terrorism. Back in September 2004, Aldo Borgu of the Australian Strategic Policy Institute provided 20 basic facts about the nature of terrorism and our response to same. He reminds us that "modern terrorism is a phenomenon that policy makers have been dealing with for at least 40 years". He further contends that the conventional political language used (e.g. describing terrorists as "cowards") might help mobilising the nation to fight, but it doesn't always help us to understand exactly what we are fighting. ... [u]ltimately, how you define who's a terrorist and what constitutes a terrorist act all comes down to the politics of the day. It isn't terribly fashionable to refer to Tibetan monks as terrorists, but it has become most unfashionable not to refer to Islamist (or even nominally Muslim) insurgents anywhere as terrorists. The only reason the US has defined the various Chechen groups fighting the Russians and Muslim separatists in Western China as terrorists, is the US needs the support of the Russian and Chinese governments. If we were still in the middle of the Cold War we'd be embracing the Chechens as allies and probably funding their activities. That probably explained why we backed the Afghan mujahideen during the 1980s. What was that? The West sponsoring Islamic jihadists? Never (not)! We often hear the mantra from our politicians that terrorists hate us for who we are as opposed to what our policies are or who we unconditionally befriend. Borgu describes this as a cop-out, "a convenient argument for any government to make because it lets them off the hook for taking responsibility for their actions. But it's also dangerous thinking. If you really believe that, then it makes you more liable to make foreign policy decisions without consideration of the consequences". Yes, our foreign policy does have implications for our security. If it didn't, our former PM Mr Howard would never have argued that invading Iraq would make Australians safer and reduce the likelihood of a terrorist attack. So as we approach the anniversary of the 9/11 attacks on the United States, we should ask ourselves about whether blindly fighting terrorism without addressing the grievances used by terrorists to garner support will really make us safer. Some 3,000 people died in the 9/11 attacks. More than the same number of Afghan civilians died in the first 3 months of the Allied invasion. We cannot allow the rhetoric of politicians to blind us to terror realities. After all, how many Australian politicians send their sons and daughters off to fight in the deserts of Afghanistan and Iraq? First published in ABC Unleashed on 10 September 2008.